Second graders share what it means to be kind. We provide our students with a variety of supports to help them (and you) successfully navigate their elementary school years. Please click on a link or scroll down to learn more. Teaching approaches designed to prepare our students to become responsible, community-oriented adults, including inquiry-based learning, social-emotional learning, positive discipline, restorative practices, and multi-tiered systems of support. For interested middle-school students, we partner with nearby Lakeview High School to offer algebra and geometry classes. Middle school or junior middle school teachers will work with you directly to determine if this is appropriate for your student. A full-time school counselor, a psychologist, a speech therapist, and an extensive support team, whose primary responsibilities are to promote the academic, personal and social development of all students, and as-needed counseling referrals. These are always free for our students and always kept private. A library stocked with age-appropriate books for students, and a leveled-learning room filled with books for teachers to use for their classes as students reach new reading levels. Along with our integrated arts approach, we use five teaching and guidance approaches to support our students in their development to becoming responsible, community-oriented adults. These approaches are used at all grade levels and in all classrooms at Ravenswood. Class meetings and decisions are encouraged, even to decide how best to decorate a class cool-off center! We use inquiry-based learning to increase student engagement. Students are encouraged to identify questions that they would like to explore, and are given time to research and engage with the topic. Students frequently share their learnings with others, and reflect on what worked well (and what didn’t work well) with their approach. We provide support structures to ensure that each student gets the help they need. For example, if your student is a struggling reader, we may pull him out of the classroom for 30 minutes during the day, or provide more intensive instruction 2-3 times a week. We may also adjust our curriculum levels and goals if a group of students are struggling, or provide before and after school interventions for students. Recent research tells us that children are hardwired from birth to connect with others and that children who feel a sense of connection to their community, family and school are less likely to misbehave. To be successful, contributing members of their community, children must learn necessary social and life skills. Positive Discipline is based on the understanding that discipline must be taught and that discipline teaches. Social and emotional learning (SEL) is the process through which children and adults acquire and effectively apply the knowledge, attitudes and skills necessary to understand and manage emotions, set and achieve positive goals, feel and show empathy for others, establish and maintain positive relationships and make responsible decisions. Restorative Practices are ways of proactively developing relationships and community, as well as repairing community when harm is done. After conflict or harm, RP provides a way of thinking about, talking about and responding to issues and problems by inviting all participants to discuss their feelings and opinions, identify what happened, describe how it affected everyone and find solutions to make things better. Our counseling room is designed to provide students with a comfortable and relaxing environment. Students can use the room to talk, relax, cool off, or refresh. Welcome to the Ravenswood Counseling Department! Our counseling vision is to holistically prepare students academically, personally and socially for fulfillment and success in high school, post-secondary, college and career choices. Our overall mission for the Counseling department is to implement a developmentally appropriate program fostering student growth and success. A safe and respectful learning environment will be promoted through culturally relevant prevention and intervention activities. Students will be supported individually, in small groups and in classroom settings to build academic, social/emotional and college/career knowledge and readiness. By serving as advocates for equity, access and the success of every student, we expect to graduate college-ready, responsible citizens who can effectively advocate for social and environmental causes. Ms. Picinich is the School Counselor at Ravenswood. She is excited for this upcoming school year and looks forward to building a relationship with you and your child! As the Counselor, her primary responsibility is to promote the academic, personal, and social development of all students. She will be collaborating with you, teachers, staff, and outside organizations to ensure we can support your child(ren) in the best way possible! 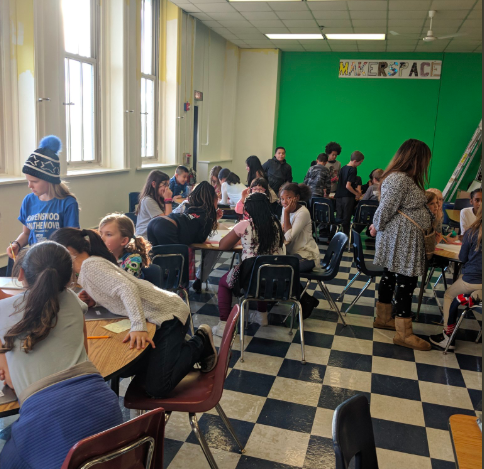 Some of her responsibilities at Ravenswood include: large-group lessons (various social-emotional topics); small group guidance; individual student support. Ms. Picinich originally hails from upstate NY where she received her BA in Psychology & Women’s Studies from Hobart & William Smith. She started teaching on the west-side of Syracuse in 2004 while earning her MS in Literacy from Syracuse University. In 2007, she packed up and moved to the Windy City where she continued to work with diverse learners while earning her masters in both Community and School Counseling. In her free time you can find her out by the lake in a hammock reading a book, working on a DIY project, cooking for people, or training for a marathon/triathlon. She is so grateful to have found her home in the Ravenswood community! I am very excited to be working with Ravenswood! I’ve been living in Chicago for seven years and working as a speech-language pathologist for CPS all over the city since 2012. I’m originally from upstate New York where I graduated with my masters degree in Communication Sciences and Disorders. When I’m not working, I love spending time traveling and cooking. I look forward to working with the wonderful students and staff at Ravenswood! This referral form is for Parents and Guardians of Ravenswood Elementary School students. The counselor will contact either you or your child within two school days of receiving this referral. If this referral is urgent or you are concerned for the safety of your child, please contact the school counselor immediately at 773-534-5525 or kppicinich@cps.edu. There is NO CHARGE for students to meet with the counselor, and all information will remain confidential. Thank you for contacting us! We will respond within 2 business days. If you need help immediately, or are concerned for the safety of your child, please contact us at 773-534-5525 or kppicinich@cps.edu. Students learn in a variety of ways. There are many outside resources that may be helpful! We host a Back to School BBQ designed to re-introduce our community and provide parents with information on many of the programs available at Ravenswood. We host parent workshops on a variety of topic through the year. Please keep an eye on our school calendar for upcoming sessions. Parents - we understand that supporting your students through their elementary and middle school years can be a challenging process! We want to support you in any way we can. We also offer regular workshops focused on specific aspects of parenting. These cover everything from sexual education to homework coaching. You can view upcoming sessions on our School Calendar. We’re here to support you through the high school planning process, from initial research, through exploration, through your application and acceptance! We’ll advise you on the GoCPS process, and provide insight on different options to help support your planning. We also host a series of workshops, in partnership with GoCPS and local organizations, to help you navigate the high school application process. Please keep an eye on our school calendar, newsletter, and social media feeds for more details.